"Today was a real tough day for me. Sparring is tough. The first guy I sparred, today, has always been real tough for me. Granted, he’s younger than me but the guy’s an animal. 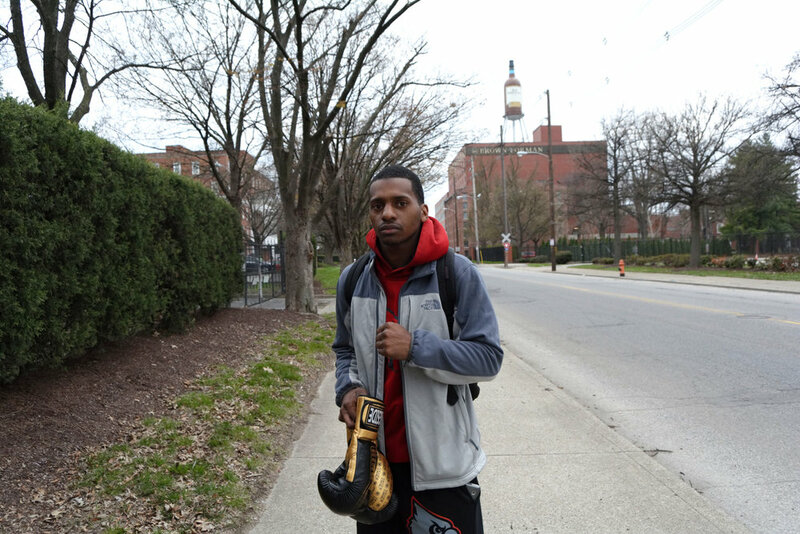 He got into boxing after he got jumped and then he just took off. I was real upset about today and that’s why I decided to walk home instead of my brother picking me up. Talking to you actually made my day, man. What got me into boxing? Muhammad Ali influenced me. I look at boxing as another outlet for me to bring my family out of poverty and help out my community by giving back. I want to put gyms and community centers in the West End and help kids out. I really want to give kids something positive to look up to. I want young black men and women to know that you can do anything you want to do, no matter where you come from. I’m at the bottom right now but I’m not letting that stop me. With life, you get knocked down and you get back up. Just like boxing, just because you get knocked down, it doesn’t mean that the fight is over. If you know how to maneuver around getting knocked down, you go on and continue to fight, until you get that win. I look at boxing just like I look at life. Greatness motivates me. I wanna be great and I won’t stop. Once I start something, I won’t stop. My family keeps me going. I told my father when he was 36 that by the time he turned 40, he wouldn’t have to work no more. He’s 41, now. I’m a little late on that. I was into football when I told him that. Now, since I’ve gotten into boxing, I just catapulted. I’ve been at for 2 years. Every time, I think about giving up, my father will give me that pep talk and will give me that look. I can’t disappoint and let him down. I feel like I’m fighting for him. He’s been raising me all his life and never gave up. I can’t give up on him because he never gave up on me.